I’m back from a wonderful trip to the South Island of New Zealand. I’ll cut to the chase, it is one of the most beautiful countries I’ve been to. It takes a long time to get there, but it is worth it! I’ll start with a personal favorite from one of our first days out with our group. Most were shooting the opposite direction over a lake with mountains behind it. Not me, I was drawn to the soft light on the beautiful grasses in front of the stream and stand of trees. When I lecture, I often speak about the so called rules and ask why we listen to them? Should we? Or should we do what feels right? Who made the rules anyway? I’m of the mind that we should follow our heart and personal vision. While this image is not cut in half, it is very close. Does it bother you? Did you even notice until I asked? I did not notice until I was reviewing it in Lightroom. I asked my tour partner Dan Sniffin if it bothered him and he said no. In thinking more about this, I find it interesting that I even needed to ask. I knew I loved it when I made the capture and that should have been all that mattered. However, because of the MFA types out there who are eager to point out every broken rule, I’ve been conditioned to be concerned about it. Even if Dan had said that it did bother him, I would have stayed true to my vision and kept it as it is! That has not always been the case though. Approval from others was much more important than it is today. I’m happy to be in a place where my connection to and satisfaction with an image is good enough. If others like it too, icing on the cake! It’s never about rules. It’s about composition, beauty and communication. Where the horizon is placed is really irrelevant. You want to communicate a sense of place. Well…. You’ve done that so you’ve got the icing and the cake. Now go shoot some more photos of this beautiful place. Thank you Rich. Well said. When we went to New Zealand, I thought it was often all about the sky so including it as half of an image is just fine…..in fact, maybe it should even be more! New Zealand is one amazing place to visit, hope to get back there again. Look forward to seeing more of your images, John. You’ll see more “sky” images Eric. Thanks for stopping by. Beautifully seen and composed shot, John ! I normally struggle with vertical landscapes, but not with this one. It’s perfect ! Now please go put on your “We Don’t Need No Stinkin’ Rules” T-shirt ! Slainte ! Thanks Bruce. Tee shirt on! In the interest of full disclosure, John, I have to confess how the tenor of your comments led me to interpret the “MFA” acronym in a less than traditional way. You get three guesses to come up with what I was thinking.. Hint: it’s not repeatable here in public. : )) Wishing you great light ! I like it too! Would be a shame to waste that blue scoop of sky at the top just to meet some arbitrary “rule”. Trees and river establish uncentered nicely. I am drawn to the meander of the water and the contrast of textures between grass and clouds – spectacular. Thank you Jazz. Your words capture exactly what I saw and felt, thank you. Hell, there are no rules here–we’re trying to accomplish something. Excellent Mil! Thank you! Need to add that one to my list of great quotes! Thank you for your feedback Ann. I especially like your intuitively created comment. I love it John. I’m always drawn to yellow grasses with some darker background such as the trees, and dark cloudy skies. My set of rules are my eyes. Thanks for sharing. Good set of rules Debbie. Really nice image that makes you want to be there. If the sky had been a stark solid blue I probably would have noticed the half & half closeness, but the interesting clouds make it not matter. I have been faced with the same thoughts when composing a landscape, but decided that the clouds added so much more I didn’t want to leave them out. I guess it’s all about the image at hand & not so much the “rule”. Hey Arnie, Good to hear from you. Thanks! John, Really like the softness and tranquilly of this image but, even more so, the comment of you being in a place where pleasing yourself in creating images is your guide. After making images with art directors and editors for many years, I’ve “finally” arrived at a time too-where the image is important to me and me alone. What freedom and feeling I can’t even describe!! John, any photographer who looks at this and thinks RULES should take up another hobby. It’s wonderful! I really like this shot. Pleasing composition, good exposure and use of natural light. Well done. Hello Dave, thanks for your thoughtful comment. To me the star of this image is the gorgeous light. And it is falling on so many lovely elements. Well seen! I agree John, follow your heart, your instincts will always lead you in the right direction. It’s a beautiful photo, one that caught my eye and caused me to pause. Rules are made for those who need them and a guide for those who trust their own vision. Following you heart is spot on Memory. I agree “rules” are good for beginners to give a solid baseline… but then they need to be put aside as they do not always apply. Always good to be with you Sara! It was a great trip! And, your wonderful clouds! Welcome back! Ditto to what Sara said above.. I too am sensitive to the rules.. But I gave them no thought when looking at this gorgeous image. My immediate thought was that you must have shot this before the tour started because I never saw this vista. I must learn to watch where you go in future so I don’t miss such beauty. Marvelous image and yes, it was a fabulous tour. What a gorgeous country. You’re lucky to still be there! Yes, this was one of our first stops where we walked from the buss to the lake in the open field. Here, here John, I totally agree. I’ve always believed in following your vision. An image has to come from your heart, that’s what will show thru to the viewers. Then let the chips fall where they may. I didn’t realise you were in our beautiful country, we are the hidden jewel nestled away from the rest of the world. Glad you enjoyed your trip and do hope you get a chance to return. I love breaking the rules and in fact often put the horizon line through the middle. Meg, you have an amazing country! Truly magnificent. I love this image John. I love grasses and skies with lots of clouds as well. There is a beautiful softness to the image. As you teach in workshops, look all around the scene. Welcome back JB! Another awesome image and post. I did notice the close split… but, it works quite well! JBism Rules! What more can be said… Rules are our foundation and assist us in development. As we progress, those rules become second nature, but typically are embedded within our thoughts, visions and creative processes. As like recipes, we evolve and add our own flavors and ingredients that fit, intensify or please our tastes. As with walking, who mindfully thinks about the efforts of placing one foot in front of the other or all the mechanics that are involved in walking… Yet, when we think about the process or lose the ability to walk, we are reminded of how complexed the simple process such as walking can be. From the acts of seeing, taking and to process a photograph… There are many rules, elements and conscientious efforts that we make… Yet, as we become familiar, we do not necessarily think of each and every step or process. As like a familiar dance or song, we move with the beat and make our mind, body and soul sing within the rhythm of what we see and feel within a moment. Photography is a tough dance step and difficult song to sing! Your image has a lot of rhythm and flow. From the clouds, to the water and blades of grass… it all jumps off the image. Great post! Great thoughts Stephan. Thanks for sharing. New Zealand just moved a few slots up my list of places to get to. Tim, I would go to the South Island in a heartbeat again. It was magnificent. JB, if you put a ruler on it-possibly it half & half. 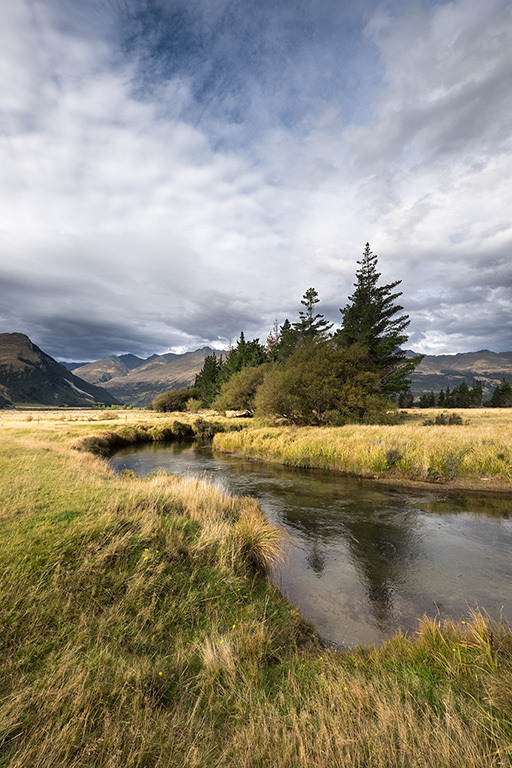 If you put your eyes on it instead then you are lead by the low angle of the beautiful grassy area and stream which appears to stretch out the the spares leading to the sky. You are then presenting by the repeating “V” patterns in the clouds, the mountain tops and between the trees. With all of that movement and beauty, whose got their ruler out? Not me! Gorgeous image. Looking forward to more rule-breakers from NZ and beyond. Great words of wisdom! I am taking them all in!! The almost centered horizon does not bother me a bit and I do not think I would have ever commented on it had you not mentioned it. I am unfortunately still in the caring way too much about what other people think place. It is probably the biggest deterrent to my development as a photographer but I do not quite know how to get past it. Maybe I can make the kind of progress you describe for yourself. Any tips?